[PDF] American Treasures: The Secret Efforts to Save the Declaration of Independence, the Constitution and the Gettysburg Address | Free eBooks Download - EBOOKEE! Description: On December 26, 1941, Secret Service Agent Harry E. Neal stood on a platform at Washington's Union Station, watching a train chug off into the dark and feeling at once relieved and inexorably anxious. These were dire times: as Hitler's armies plowed across Europe, seizing or destroying the Continent's historic artifacts at will, Japan bristled to the East. The Axis was rapidly closing in. So FDR set about hiding the country's valuables. On the train speeding away from Neal sat four plain-wrapped cases containing the documentary history of American democracy: the Declaration of Independence, the Constitution, the Gettysburg Address, and more, guarded by a battery of agents and bound for safekeeping in the nation's most impenetrable hiding place. American Treasures charts the little-known journeys of these American crown jewels. From the risky and audacious adoption of the Declaration of Independence in 1776 to our modern Fourth of July celebrations, American Treasures shows how the ideas captured in these documents underscore the nation's strengths and hopes, and embody its fundamental values of liberty and equality. 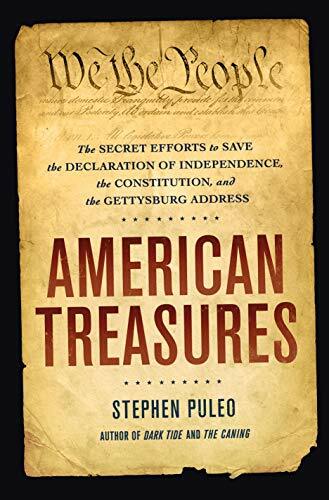 Stephen Puleo weaves in exciting stories of freedom under fire - from the Declaration and Constitution smuggled out of Washington days before the British burned the capital in 1814, to their covert relocation during WWII - crafting a sweeping history of a nation united to preserve its definition of democracy. 2017-12-27[PDF] American Connections: The Founding Fathers. Networked. No comments for "[PDF] American Treasures: The Secret Efforts to Save the Declaration of Independence, the Constitution and the Gettysburg Address".